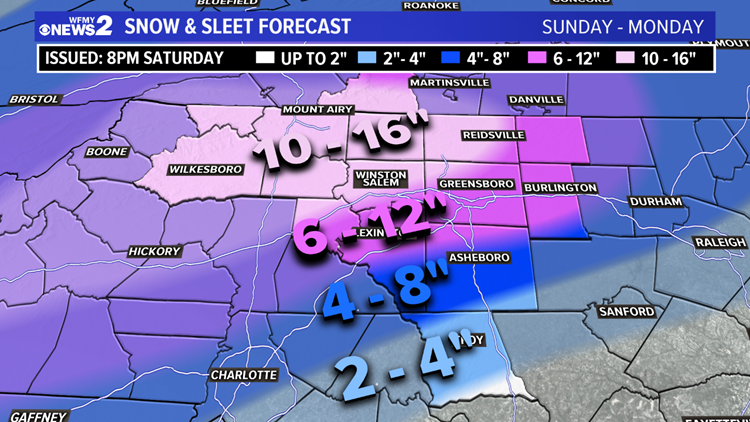 Lots of snow and ice on the way to the Piedmont Triad. 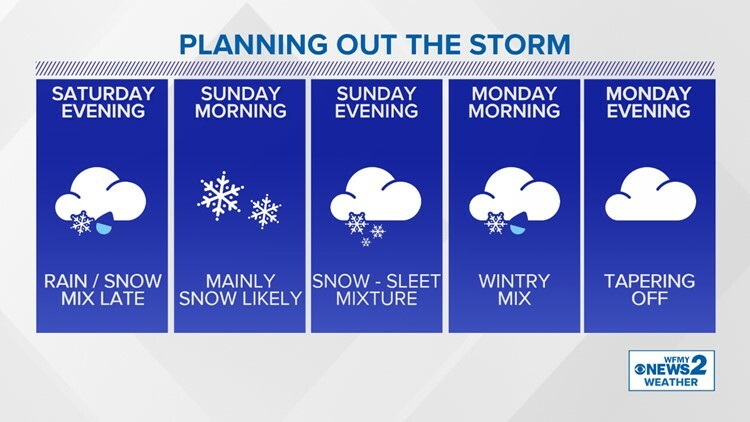 Storm will drop the wintry mess on Sunday into Monday. GREENSBORO, NC -- We've talked about it all week, and now it's here. We've already seen several inches of snow across the Triad, generally 6 to 12 inches. Even more is possible to the north and west, and to the south and east icing is a real concern. We'll need to watch for power outages. 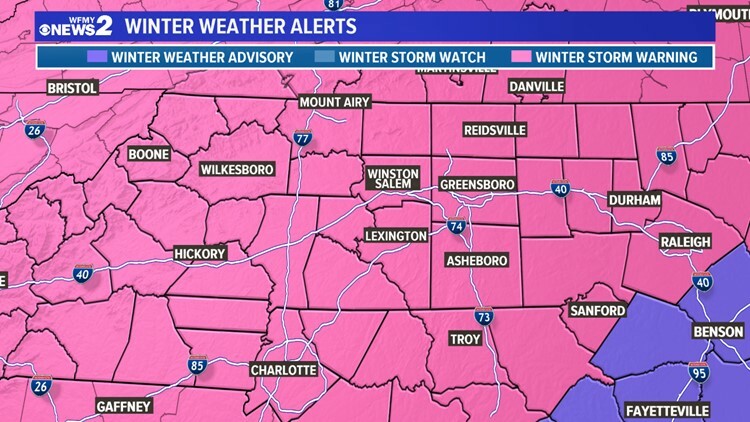 The National Weather Service has issued Winter Storm Warnings for all of the Piedmont, effective Sunday, lasting through Monday. This means winter weather is imminent, and that you should be prepared for rough travel conditions and possible power outages. A strong winter storm is forming over the Gulf of Mexico. It moves up the coast and into the Carolinas by Sunday morning, sticking around through part of Monday. This is a classic winter storm setup for North Carolina, with a strong high pressure area to the north, and moisture laden low pressure from the Gulf. This will combine to create snow on Sunday, but also some sleet and freezing rain. By late Saturday evening, after sunset, we could start to first see precipitation in our southern counties. A mix of rain and snow at first, transitioning into mostly snow overnight into Sunday. The heaviest we'll see will be on Sunday, with a mixing of sleet at times. Several inches are likely to accumulate during the day. By Sunday evening, more of a mix of sleet and possibly some freezing rain will occur. A lingering and lighter wintry mix will be around on Monday before the storm pulls away. Significant snow accumulations are likely for pretty much all of the Piedmont. The tricky part is how much sleet mixes in withe the snow. 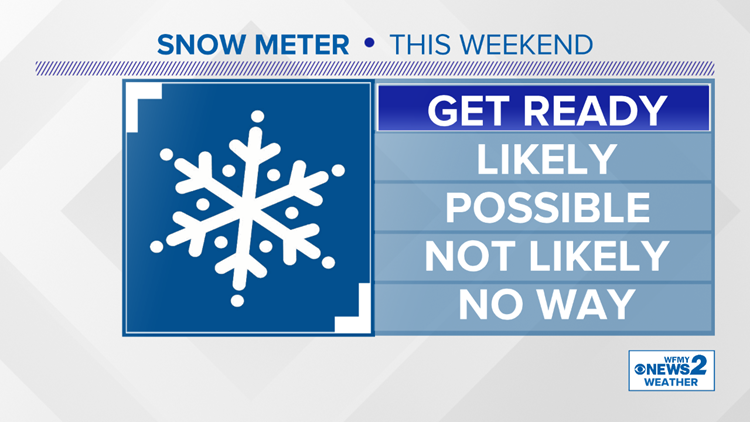 The highest amounts will be in the Foothills and Mountains where over 10" is possible, with lower, but still significant amounts south and east of I-85. Here is our snow & sleet map as of midday Saturday. Keep in mind, totals can vary a little up or down from this forecast if there's either less or more mixing with sleet than anticipated. Icing is also a significant concern during the storm. 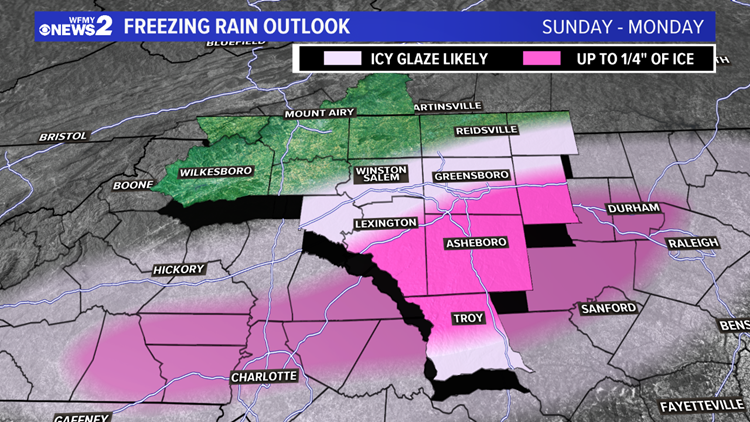 The best chance to see an icy glaze or more will be from the Triad cities, and along and south of I-85, outlined in the map below. We're likely to see dangerous travel at times on Sunday and Monday, with neighborhood roads potentially staying rough for several days. Power outages are a possibility given the likelihood that we'll see a heavy, wet snow. It's a good idea to find your winter gear. Things like shovels, mittens, gloves, etc that you haven't used since last winter. It's possible we could have power outages, so those supplies are a good idea, along with some food you'd like to have during a storm. 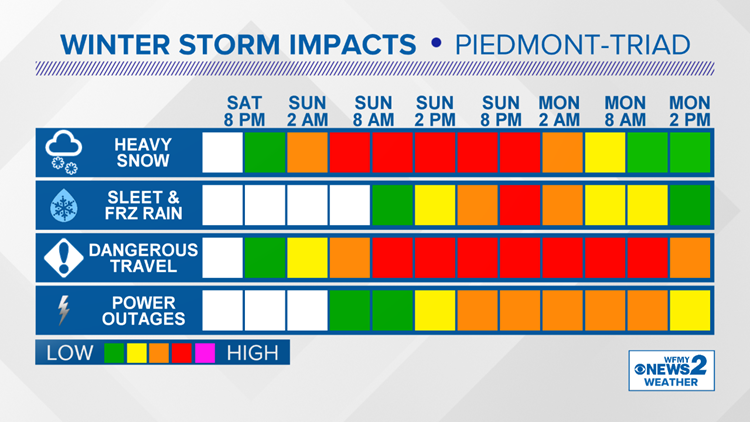 Stick with WFMY as we lead up to the storm and during the evening this weekend for full coverage.